I had this bottle for a while, and had an opportunity to open it a few days ago. 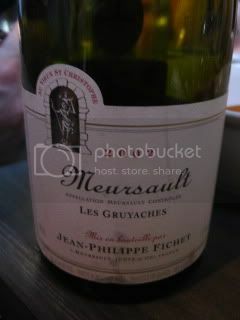 2002 Domaine Jean-Philippe Fichet, Meursault, "Les Gruyaches". This is Fichet's old-vine (about 80-years-old) super lieu-dit, right below Les Charmes 1er Cru. The wine was slightly-shy in the beginning, but after about 10 minutes, it opened up beautifully with exotic spice, mineral, tropical fruits, etc. The flavor was very complex with a long finish. I could also smell the earthy character, like from a wide-spread field. Gorgeous. We had it at The Spice Table in Downtown LA, and the best pairing with this wine was their beer-batter fried soft shell crab! It was actually my second time to try the dish...I got lucky to try it again by the end of the season. The crisp batter with the naturally-sweet crab flavor complemented the rich character of the wine very well. 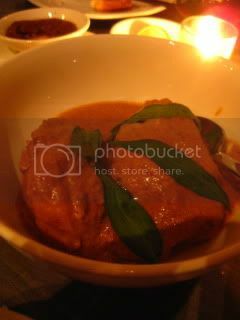 The sauce (duck-egg based) was not overpowering, and the creaminess worked perfectly, too. I've been going to The Spice Table (already) many times since it opened a few moths ago. 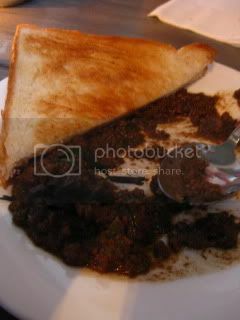 The food is always great and so as the service there. Among the items I always order there is chicken liver pate, fried cauliflower, and chicken curry. Their Hainanese chicken is also superb...I must say the best in town. I'm probably going back again next week!